And another fun adventure in Trader Joe’s. I’m a kid in a candy store there. Two Fearless Flyers ago there was mention of some goodies that made you feel like you were having Dim Sum. Had to go find those. Well, come to find out I grabbed the wrong thing (after reading the flyer again when I got home). The flyer item was Steamed Chicken Soup Dumplings. But, these are one of my favorite items at Dim Sum — Cha Siu Boa, a Chinese Style Pork Bun. You just pop these things in the microwave for about 45 seconds, let them cool and they’re ready to enjoy. I learned that you really do need to let them cool — yikes! The bread part is so soft, and the pork just has a nice sweetness. They also come on that paper that makes you feel like you’re at a restaurant, truly enjoying dim sum. Simple pleasures. Another Trader Joe’s problem while I discovered; scalloped Cracker Trio. Boxes of these were, of course, used as a display on aisle-end and looked far too tempting – had to try. The box has three flavors – Rosemary, Red Chili and Garlic. The crackers have a nice thickness to them but still are a bit soft. They sort of crumble, but in a nice way. They also almost taste like they might have some butter to them, but per the ingredient list, they do not. Perfect to pair with soups, salads and just to munch on. Recommend giving them a try. If you speak Spanish, you might be thinking napkin. But, if you look around the cheese section at Trader Joe’s you might know I’m talking cheese. Found this one recently, which is a goat cheese, aged in cloth (which I am sort of thinking is where they got the name) for at least four months. It has a subtle bite and is more firm than the ‘normal’ goat cheese. It can be easily cut, as in it doesn’t squish. Nice to serve on crackers, with veggies and to pair with wine. Progressing on the trip in Iceland, you don’t necessarily want to eat PBJ each day. Some food was also brought from home. So one day we enjoyed some great individual packs of Bumble Bee Light Tuna, Trader Joe’s Sun-Dried Tomatoes, Trader Joe’s Marinated Olives, and some of the bread we bought for the PBJs. We also had a bit of wine left to kill that we’d bought a couple days prior. So we had paper coffee cups from a hotel brunch and probably each got half a glass of Trapiche Malbec. Living the high life! This was also on a day that was sunny. Only reason we had to sit in the car was because of the million mile an hour winds we had (90% of the time we were in Iceland). Enjoyed this while visiting Þingvellir National Park (or Thingvellir in English) and seeing some other beautiful sites. As you might have read several times in my blog(s), Trader Joe’s is one of my two favorite grocery stores (Wegmans being the other). The other thing you might have read is that I am a lactard (thanks Caroline for giving me that term, as you are also one), but can eat goat or sheep’s milk (cheese). While strolling through TJ’s recently I was just really wanting some cheese. Stood there staring at the cheese section for several minutes then my eyes fell upon these ‘baby goat’ (as I like to call them) cheese discs. They are just the goat cheese logs divided into smaller pieces, or as they more appropriately term them Medallions. Each package is 1oz., very nicely sealed and there are about 5-6 per container. Of course I can’t remember the price, but I’m fairly certain it was less than $5. Handy to have around and they will definitely be making it to my kitchen more frequently. I love seafood, I love smoked seafood. So on my weekly or bi-weekly trip to Trader Joe’s I of course swung by the demo station. Had a bite of what they were serving (I think it was a egg salad). And at the station, they had a stack of Smoked Trout. While I have had their (and others’) vacuum packed/sealed stuff, this one was canned. Think of a sardine can, with a pull-top lid. It’s farm raised (not my favorite), skinless and in canola oil. So I grabbed some and used it on a salad. Simple arugula, tomatoes, kalamatas, hearts of palm and baby Brussels sprouts. Just delicious blend of flavors. So as long as you’re not totally against the farm-raised, this is great stuff to have on hand. Stack it in the cupboard with the tuna and the other stuff and you’re good to go. Pretty much my favorite place to do grocery shopping is Trader Joe’s. Well, that is because there isn’t a Wegmans close by (DC residents, have you heard the latest rumor about the Fannie Mae building on Wisconsin Ave and them looking at the space??). Anyway, there is of course point-of-purchase stuff at TJ’s and one I opted to grab recently was their Mixed Nut Butter. It’s a blend of Dry Roasted & Salted Almonds, Cashews, Walnuts, Brazil Nuts, Hazelnuts & Pecans. Sounds great. I’m just not a huge fan of the Brazil nuts, but I’ll eat them. It doesn’t say smooth anywhere, which is cool, too. The flavor was ok, but it was almost too many flavors fighting with each other. When you buy mixed nuts you can taste each one on its own. I also love chunky nut butter and it was a bit too smooth, for me. Not much salt in it, though salt was an ingredient. Not something I’ll buy again, but glad I tried it. Price was $5.99, I think. Not cheap, especially for the size. Totally worth the test. Was on just a normal shopping trip the other day so had to stop at Trader Joe’s. That also meant I was required to stop by the sample and coffee counter. They had a cheese sample out, so at first I didn’t think I could have some as the lactard. Then I saw that it was goat cheese, cool. 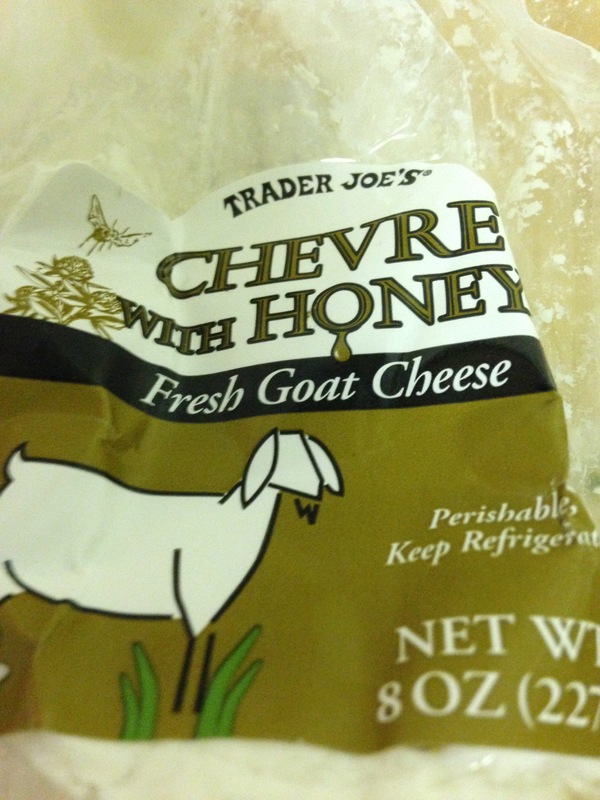 It was a new one — Chevre with Honey. Just a little bit of sweet taste. I used to not like goat cheese but it has gotten so much better. Ok, bad idea to try it… Effective work TJ’s… I left with one of the 8 oz. packages. We’ll see how long it takes me to get more.